Nikon have made some big changes to their flagship compact system camera, which is now seemingly targeted at more casual consumers, rather than the keen enthusiast that the previous V2 specifically catered for. The removal of the electronic viewfinder in particular, now only available as an expensive and bulky add-on, along with the much smaller, less secure handgrip and the switch to microSD cards are testament to the V3's new focus. It does now offer a useful second control dial, tilting touchscreen LCD and incredibly fast burst shooting speeds (even with autofocusing) in a smaller, more pocketable body, but overall we can't help feeling that the new Nikon 1 V3 is a less well-defined product than its predecessor - too expensive for the mass market and with less appeal as a photographer's tool. Concessions have also been made with regards to the Nikon 1 V3's image quality, with the jump in megapixels from 14 to 18 making the resulting images objectionably noisy at ISO 1600, rather than at ISO 3200 as on the V2, especially for the RAW files. 18 megapixels is a little too much for the small 1-inch sensor, despite the removal of the optical low-pass filter. 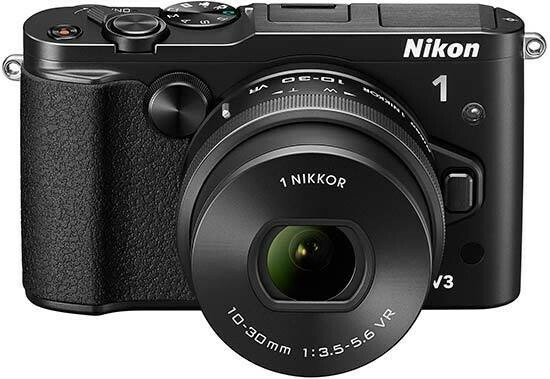 The Nikon 1 V3 also has rather a high price tag for a camera with such a small sensor, with lots of competition from very capable Micro Four Thirds and even APS-C sensor camera at this price-point, not to mention the likes of the Sony Cyber-shot DSC-RX100 III compact, which offers the same-size 1-inch sensor in a smaller body complete with a faster lens and built-in viewfinder.